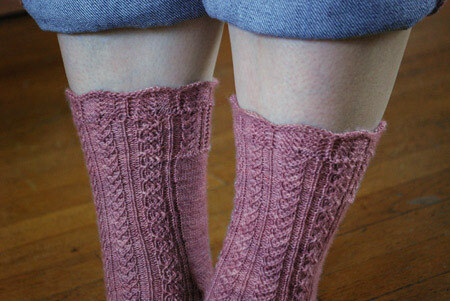 Pattern: Estonian Socks by Nancy Bush, from The Ultimate Sock Book by Vogue Knitting. The pattern is beautiful, and very easy to knit without a chart once you get the hang of it. It still took me four months to finish this pair of socks, but that’s mainly because I’m scrambling to outfit an army of babies. Needles: Susan Bates dpns , US 0. Yarn: Paddington handpainted sock yarn, 100% British Blue Faced Leicester 3-ply superwash wool, Ashes of Roses colorway (422 yards, 3.5 oz). The yarn vendor is Mocha’s Fiber Connection in Colchester, CT, and I purchased this skein at the 2009 New Hampshire Sheep & Wool Festival. I didn’t find working with BFL particularly different than working with merino, but I was happy to have the experience nonetheless. The fabric is lovely, and feels very durable. This particular yarn is definitely on the thin side – my gauge was 9.5 sts and 13 rounds per inch, eek! That’s the main reason I went with the Estonian Socks pattern: it’s written for 9 sts and 12 rounds per inch, while most other sock patterns use an even larger (or is it smaller?) gauge. I ended up omitting a few calf decreases to make a comfortable foot circumference, and worked the foot over 76 stitches. So, it’s very easy to see that these socks are an approximate reincarnation of the Traveler’s Stockings I knit many years ago: same designer, similar scalloped edge and yarn color, twisted stitch design elements. And you know what? I loved knitting both patterns :). Interestingly, neither sock pair ended up with my grandmother, an obvious candidate for receiving anything “dusty rose”. The Traveler’s Stockings went to my great aunt, and these Estonian Socks I gave to Stacie who’s a crafty superstar, and has been helping me with all sorts of things lately. I hope she enjoys them! THose are gorgeous! I have that book. I should take a crack at those. They’re so beautiful! The color is especially gorgeous! these are beautiful! i love the way they look from the back. the fancy cuff and heel are my favorite part. Gorgeous socks as always! The color is just wonderful. Love these beauties, what’s next for your Grandmother’s feet? Hey socks! Long time no see. Nancy Bush never fails to deliver a great pattern and I particularly like this shade of pink. Wow, those are so beautiful. Oh, Kathy, they’re just breathtaking. I loved this sock pattern in the book and have had it marked for some time now. Lucky Stacie! What great socks! I love the cuff. I love those – they’re so beautiful! And Stacie is awesome! Those socks are stunning, of course! I AM loving them! And I loved showing them off to everyone in the MidWest, too. They are super-fantastic-comfy-cozy-beautiful 🙂 Thank you! They are so precious! Love the way they look and they are very original! Congratulations! Those are beautiful. That colorway is excellent for the pattern. Wow, those socks are beautiful. Something I hope to work toward – being at that level of knitting. Beautiful! Thanks for the BFL review. I have that book, and I don’t think I even thought to make them. I think I will have to rethink this, because I love the heel patterning too much not to at least crib that for my next pair of socks. Oh, they’re gorgeous! I just love how you keep on keepin’ on, knitting one glorious pair of socks after another. Along with all the other stuff, of course. I really enjoy your blog! Thanks for sharing this pattern, not that I need another knitting book, but I do need this great pattern.